"Sabrina" CH. Silhouette Fortune Teller, THD, CGCA, RN,TKN (Therapy Dog ), (Canine Good Citizen Advance)and (Rally Novice)and(Trick Novice) Sabrina passed away 12/2017 RIP my beautiful girl! Sabrina has a nice head piece and nice neck, nice front and rear. She has a showy attitude and has a great gait. 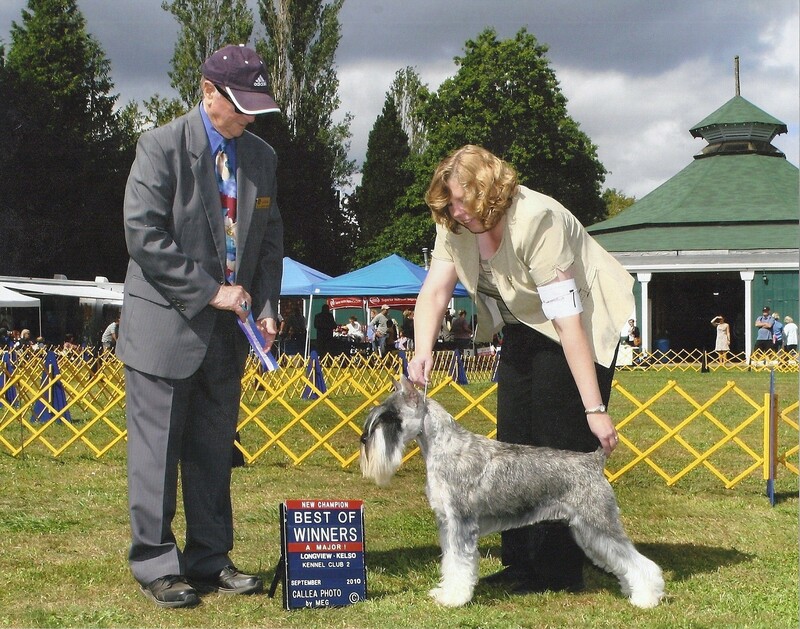 I have gotten 1st in the Bred-By Working Group at the Tacoma Kennel Club dog show. We are invited to the Eukanuba Invitationals in 2011 and 2012. She had her 1st litter this fall 2011 and is a very good mother. Sabrina has her 1st son as a AKC Champion Silhouette's Dirty Harry as of 10-28-2012. We are very proud! 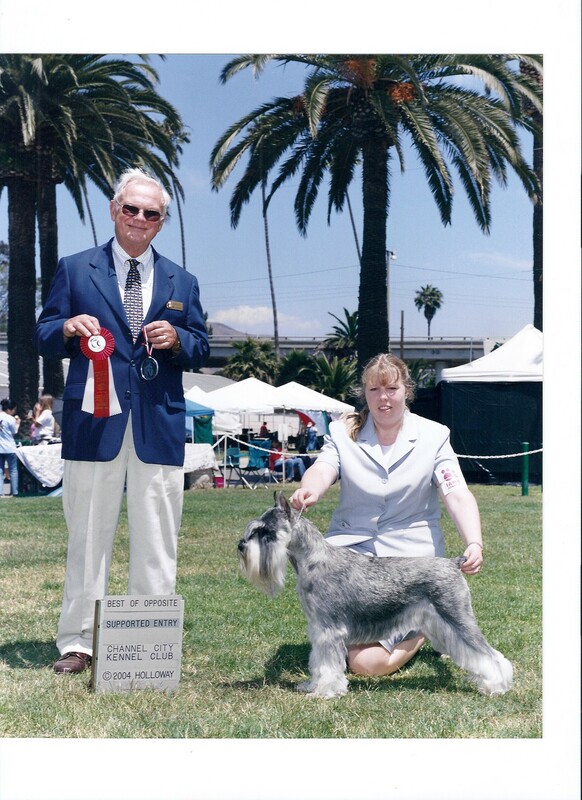 He also has his Grand Championship as of 04/2013. He got a 4th Group placement in 2014. 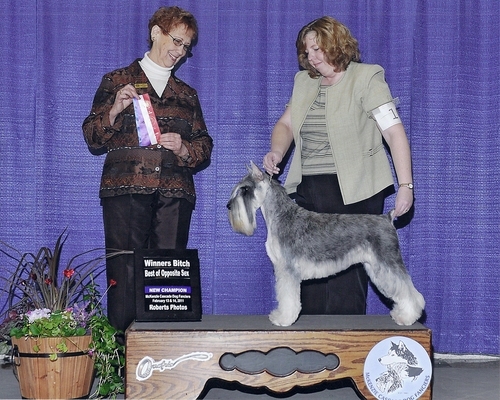 Sabrina's daughter Silhouette's Scarlett O'Hara is making her way towards her Canadian Championship amd AKC Championship. Her 2nd son AKC/CKC/INT CH. 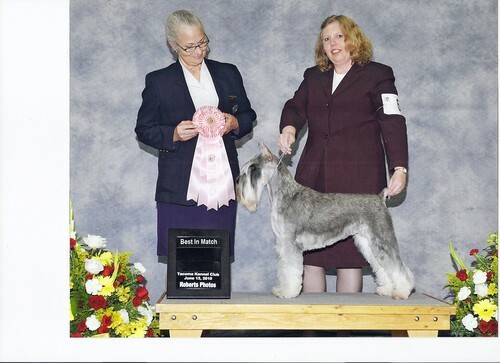 Silhouette's Work Of Art is also a AKC Champion as of 11/ 08/14. Sabrina was in her first handstrip groom show on 4/11/14 at the Northwest Groom Show in Tacoma, Wa. Sabrina is now 10 years old and a certified therapy dog. She has done 5 visits to Martha and Mary Health and Rehab facility and 5 visits to Bremerton Health and Rehab and 3 visits to Bainbridge Island Health and Rehab so far. Loving her visits and making a difference with ill people. She received her AKC Therapy Dog Novice title and her CGC title 09-8-16. Very proud!! Sabrina will be used at the Northwest Groom Show for groom competition in Tacoma, WA on 04/22/16 with Anne Francis a well known dog groomer competitor. Anne Francis is on the Groom Team USA!